This article is about the biological process. For other uses, see Metamorphosis (disambiguation). Metamorphosis is a biological process by which an animal physically develops after birth or hatching, involving a conspicuous and relatively abrupt change in the animal's body structure through cell growth and differentiation. Metamorphosis is iodothyronine-induced and an ancestral feature of all chordates. Some insects, fishes, amphibians, mollusks, crustaceans, cnidarians, echinoderms, and tunicates undergo metamorphosis, which is often accompanied by a change of nutrition source or behavior. Animals that go through metamorphosis are called metamorphoses. Animals can be divided into species that undergo complete metamorphosis ("holometaboly"), incomplete metamorphosis ("hemimetaboly"), or no metamorphosis ("ametaboly"). Scientific usage of the term is technically precise, and it is not applied to general aspects of cell growth, including rapid growth spurts. References to "metamorphosis" in mammals are imprecise and only colloquial, but historically idealist ideas of transformation and monadology, as in Goethe's Metamorphosis of Plants, have influenced the development of ideas of evolution. The word metamorphosis derives from Greek μεταμόρφωσις, "transformation, transforming", from μετα- (meta-), "after" and μορφή (morphe), "form". In insects growth and metamorphosis are controlled by hormones synthesized by endocrine glands near the front of the body (anterior). Neurosecretory cells in an insect's brain secrete a hormone, the prothoracicotropic hormone (PTTH) that activates prothoracic glands, which secrete a second hormone, usually ecdysone (an ecdysteroid), that induces ecdysis. PTTH also stimulates the corpora allata, a retrocerebral organ, to produce juvenile hormone, which prevents the development of adult characteristics during ecdysis. In holometabolous insects, molts between larval instars have a high level of juvenile hormone, the moult to the pupal stage has a low level of juvenile hormone, and the final, or imaginal, molt has no juvenile hormone present at all. Experiments on firebugs have shown how juvenile hormone can affect the number of nymph instar stages in hemimetabolous insects. All three categories of metamorphosis can be found in the diversity of insects, including no metamorphosis ("ametaboly"), incomplete or partial metamorphosis ("hemimetaboly"), and complete metamorphosis ("holometaboly"). While ametabolous insects show very little difference between larval and adult forms (also known as "direct development"), both hemimetabolous and holometabolous insects have significant morphological and behavioral differences between larval and adult forms, the most significant being the inclusion, in holometabolus organisms, of a pupal or resting stage between the larval and adult forms. 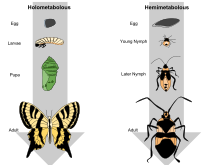 Two types of metamorphosis are shown. In a complete (holometabolous) metamorphosis the insect passes through four distinct phases, which produce an adult that does not resemble the larva. 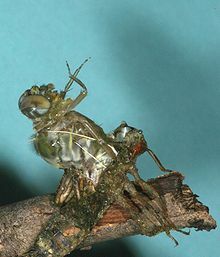 In an incomplete (hemimetabolous) metamorphosis an insect does not go through a full transformation, but instead transitions from a nymph to an adult by molting its exoskeleton as it grows. In hemimetabolous insects, immature stages are called nymphs. Development proceeds in repeated stages of growth and ecdysis (moulting); these stages are called instars. The juvenile forms closely resemble adults, but are smaller and lack adult features such as wings and genitalia. The size and morphological differences between nymphs in different instars are small, often just differences in body proportions and the number of segments; in later instars, external wing buds form. In holometabolous insects, immature stages are called larvae and differ markedly from adults. Insects which undergo holometabolism pass through a larval stage, then enter an inactive state called pupa (called a "chrysalis" in butterfly species), and finally emerge as adults. The earliest insect forms showed direct development (ametabolism), and the evolution of metamorphosis in insects is thought to have fuelled their dramatic radiation (1,2). Some early ametabolous "true insects" are still present today, such as bristletails and silverfish. Hemimetabolous insects include cockroaches, grasshoppers, dragonflies, and true bugs. Phylogenetically, all insects in the Pterygota undergo a marked change in form, texture and physical appearance from immature stage to adult. These insects either have hemimetabolous development, and undergo an incomplete or partial metamorphosis, or holometabolous development, which undergo a complete metamorphosis, including a pupal or resting stage between the larval and adult forms. A number of hypotheses have been proposed to explain the evolution of holometaboly from hemimetaboly, mostly centering on whether or not the intermediate hemimetabolous forms are homologous to pupal form of holometabolous forms. More recently,[when?] scientific attention has turned to characterizing the mechanistic basis of metamorphosis in terms of its hormonal control, by characterizing spatial and temporal patterns of hormone expression relative to metamorphosis in a wide range of insects. According to research from 2008, adult Manduca sexta is able to retain behavior learned as a caterpillar. Another caterpillar, the ornate moth caterpillar, is able to carry toxins that it acquires from its diet through metamorphosis and into adulthood, where the toxins still serve for protection against predators. Many observations[when?] have indicated that programmed cell death plays a considerable role during physiological processes of multicellular organisms, particularly during embryogenesis and metamorphosis. In typical amphibian development, eggs are laid in water and larvae are adapted to an aquatic lifestyle. Frogs, toads, and newts all hatch from the eggs as larvae with external gills but it will take some time for the amphibians to interact outside with pulmonary respiration. Afterwards, newt larvae start a predatory lifestyle, while tadpoles mostly scrape food off surfaces with their horny tooth ridges. Metamorphosis in amphibians is regulated by thyroxin concentration in the blood, which stimulates metamorphosis, and prolactin, which counteracts its effect. Specific events are dependent on threshold values for different tissues. Because most embryonic development is outside the parental body, development is subject to many adaptations due to specific ecological circumstances. For this reason tadpoles can have horny ridges for teeth, whiskers, and fins. They also make use of the lateral line organ. After metamorphosis, these organs become redundant and will be resorbed by controlled cell death, called apoptosis. The amount of adaptation to specific ecological circumstances is remarkable, with many discoveries still being made. 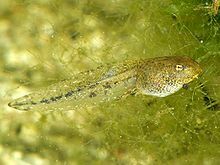 With frogs and toads, the external gills of the newly hatched tadpole are covered with a gill sac after a few days, and lungs are quickly formed. Front legs are formed under the gill sac, and hindlegs are visible a few days later. 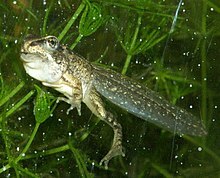 Following that there is usually a longer stage during which the tadpole lives off a vegetarian diet. Tadpoles use a relatively long, spiral‐shaped gut to digest that diet. Rapid changes in the body can then be observed as the lifestyle of the frog changes completely. The spiral‐shaped mouth with horny tooth ridges is resorbed together with the spiral gut. The animal develops a big jaw, and its gills disappear along with its gill sac. Eyes and legs grow quickly, a tongue is formed, and all this is accompanied by associated changes in the neural networks (development of stereoscopic vision, loss of the lateral line system, etc.) All this can happen in about a day, so it is truly a metamorphosis. It is not until a few days later that the tail is reabsorbed, due to the higher thyroxin concentrations required for tail resorption. The Salamander development is highly diverse; some species go through a dramatic reorganization when transitioning from aquatic larvae to terrestrial adults, while others, such as the Axolotl, display paedomorphosis and never develop into terrestrial adults. Within the genus Ambystoma, species have evolved to be paedomorphic several times, and paedomorphosis and complete development can both occur in some species. In newts, there is no true metamorphosis because newt larvae already feed as predators and continue doing so as adults. Newts' gills are never covered by a gill sac and will be resorbed only just before the animal leaves the water. Just as in tadpoles, their lungs are functional early, but newts use them less frequently than tadpoles. Newts often have an aquatic phase in spring and summer, and a land phase in winter. For adaptation to a water phase, prolactin is the required hormone, and for adaptation to the land phase, thyroxin. External gills do not return in subsequent aquatic phases because these are completely absorbed upon leaving the water for the first time. Basal caecilians such as Ichthyophis go through a metamorphosis in which aquatic larva transition into fossorial adults, which involves a loss of the lateral line. More recently diverged caecilians (the Teresomata) do not undergo an ontogenetic niche shift of this sort and are in general fossorial throughout their lives. Thus, most caecilians do not undergo an anuran-like metamorphosis. Some fish, both bony fish (Osteichthyes) and jawless fish (Agnatha), undergo metamorphosis. Fish metamorphosis is typically under strong control by the thyroid hormone. Examples among the non-bony fish include the lamprey. Among the bony fish, mechanisms are varied. The salmon is diadromous, meaning that it changes from a freshwater to a saltwater lifestyle. Many species of flatfish begin their life bilaterally symmetrical, with an eye on either side of the body; but one eye moves to join the other side of the fish – which becomes the upper side – in the adult form. The European eel has a number of metamorphoses, from the larval stage to the leptocephalus stage, then a quick metamorphosis to glass eel at the edge of the continental shelf (eight days for the Japanese eel), two months at the border of fresh and salt water where the glass eel undergoes a quick metamorphosis into elver, then a long stage of growth followed by a more gradual metamorphosis to the migrating phase. In the pre-adult freshwater stage, the eel also has phenotypic plasticity because fish-eating eels develop very wide mandibles, making the head look blunt. Leptocephali are common, occurring in all Elopomorpha (tarpon- and eel-like fish). Most other bony fish undergo metamorphosis from embryo to larva (fry) and then to the juvenile stage during absorption of the yolk sac, because after that phase the individual needs to be able to feed for itself. ^ "Metamorphosis, Henry George Liddell, Robert Scott, A, at Perseus". Perseus.tufts.edu. Retrieved 2012-08-26. ^ "Online Etymology Dictionary". Etymonline.com. Retrieved 2012-08-26. ^ Davies, 1998. Chapter 3. ^ Gullan, P.J. & Cranston, P.S. 6.3 Process and Control of Moulting in The Insects: An Outline of Entomology. Blackwell Publishing, 2005. pp. 153-156. ^ Slama; Williams (1965). "Juvenile hormone activity for the bug Pyrrhocoris apterus" (PDF). Proceedings of the National Academy of Sciences. 54 (2): 411–414. doi:10.1073/pnas.54.2.411. PMC 219680. PMID 5217430. ^ Singh, Amit; Konopova, Barbora; Smykal, Vlastimil; Jindra, Marek (2011). "Common and Distinct Roles of Juvenile Hormone Signaling Genes in Metamorphosis of Holometabolous and Hemimetabolous Insects". PLoS ONE. 6 (12): e28728. doi:10.1371/journal.pone.0028728. ISSN 1932-6203. PMC 3234286. PMID 22174880. ^ Lowe, Tristan; Garwood, Russell P.; Simonsen, Thomas; Bradley, Robert S.; Withers, Philip J. (July 6, 2013). "Metamorphosis revealed: three dimensional imaging inside a living chrysalis". Metamorphosis Revealed: Three Dimensional Imaging Inside a Living Chrysalis. 10 (84). 20130304. doi:10.1098/rsif.2013.0304. PMC 3673169. PMID 23676900. Retrieved June 11, 2015. ^ Douglas J. Blackiston, Elena Silva Casey & Martha R. Weiss (2008). "Retention of memory through metamorphosis: can a moth remember what it learned as a caterpillar?". PLoS ONE. 3 (3): e1736. doi:10.1371/journal.pone.0001736. PMC 2248710. PMID 18320055. ^ Conner, W.E. (2009). Tiger Moths and Woolly Bears—behaviour, ecology, and evolution of the Arctiidae. New York: Oxford University Press. pp. 1–10. ^ a b Laudet, Vincent (September 27, 2011). "The Origins and Evolution of Vertebrate Metamorphosis". Current Biology. 21 (18): R726–R737. doi:10.1016/j.cub.2011.07.030. PMID 21959163. ^ Dunker, Nicole; Wake, Marvalee H.; Olson, Wendy M. (January 2000). "Embryonic and Larval Development in the Caecilian Ichthyophis kohtaoensis (Amphibia, Gymnophiona): A Staging Table". Journal of Morphology. 243 (1): 3–34. doi:10.1002/(sici)1097-4687(200001)243:1<3::aid-jmor2>3.3.co;2-4. PMID 10629095. ^ San Mauro, D.; Gower, D. J.; Oommen, O. V.; Wilkinson, M.; Zardoya, R. (November 2004). "Phylogeny of caecilian amphibians (Gymnophiona) based on complete mitochondrial genomes and nuclear RAG1". Molecular Phylogenetics and Evolution. 33 (2): 413–427. doi:10.1016/j.ympev.2004.05.014. PMID 15336675. Davies, R.G. (1998). Outlines of Entomology. Chapman and Hall. Second Edition. Chapter 3. Williamson D.I. (2003). The Origins of Larvae. Kluwer. This page was last edited on 3 April 2019, at 13:06 (UTC).